Blanch the string beans in a large pot of boiling salted water for just 4 minutes. Drain immediately and immerse in a large bowl of ice water to stop the cooking. When they are cool, drain and set aside. Meanwhile, in a large bowl toss the onion and bell peppers together with 2 tablespoons of olive oil and sprinkle generously with salt and pepper. Place in a single layer on a baking sheet and roast for about 15 minutes, tossing with a spatula from time to time to be sure the vegetables roast evenly. Just before serving, reheat the string beans in a large sauté pan drizzled with a little olive oil. Sprinkle with salt and pepper and arrange on a platter. 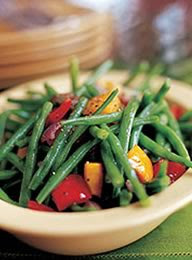 Spoon the roasted vegetables over the string beans and serve hot or at room temperature.